This is a HOW TO install for set of StopTech Front Big Brake Kit on a 2008 STi. Reason for the Install: After doing a track day, it was apparent that the OEM brake system requires allot of work to get them to perform as needed. The OEM Brembo brakes are good, but they are not sufficient for hard track use. Of course 2 piece rotors, SS Lines, fluid, Ti shims, brake ducts, etc. would help a lot, but after it’s all said and done, you’re almost up to a price of a BBK. 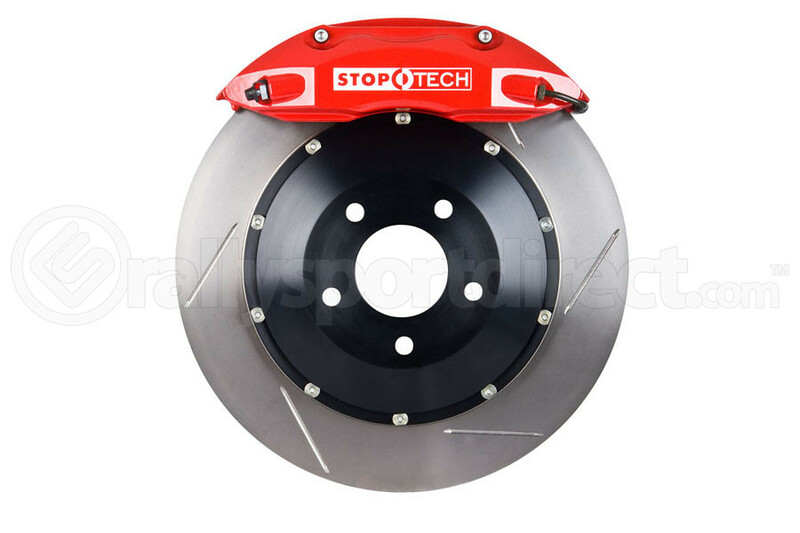 Advantages: The StopTech big brake kit is amazing. It comes with everything needed. New hardware, new brake lines, and even a little bottle of lock tight! The only thing you need to buy is some brake fluid. The calipers, brackets, and rotors are all top notch! And are as good, if not better quality, then the OEM brakes. INFO: Another reason for the brake kit was to lose some un-sprung weight and rotational mass. So with a bigger rotor that has better cooling capacity and larger surface area, you are losing 4lbs of rotational mass and un-sprung weight per front corner. Also, with a 2-piece rotor, you keep heat out of the hubs. which in turn helps keep them cool, and working longer. Side shot. The StopTech rotor is wider and has larger cooling passages. With a larger caliper that has more clamping load, you’re still 1lb lighter than OEM. Rims to clear the brake Kit. We tested 2 different rims, Prodrive GC-05 18×9.5 +44 and Enkei NTO3+M 18×9.5 +40. With the caliper now being place higher up on the rim, you actually gain clearance. With the NTO3+M, we no longer have to use a 10MM spacer (previously used with the stock brakes). Motive Power Bleeder. This makes bleeding the brakes quick and easy. It only took about 10 min to bleed the new brakes. Of course, you can also get a buddy to help you and do it the old fashion way. Brake Fluid. We opted to use the ATE Super Blue as we have had great results and the fluid stays consistent during hard driving. Catch bottle and a clear tube, so you can catch the fluid coming out of the caliper, and a clear tube so you can see when the air is out of the system. Sand Paper. This is to get rid of rust build up that is between the rotor and the hub. ANY rust will not allow the new rotor to seat properly. Soap, water, rags, and brake cleaner. The rotors have oils on them that need to be cleaned off before they are installed. Tools: All Sockets HAVE TO BE 6 POINT! As with such high TQ on some of the hardware, a 12 point will easily strip some of the bolts! Torque Wrench 1/2″ drive. This is so that you can tighten the new hardware to the StopTech specs. 1) Break loose the lug nuts. Jack up the car. Set it on Jack Stands. Pull off the rim. 2) Get the 19MM Socket with a breaker bar and take the caliper off the hub. 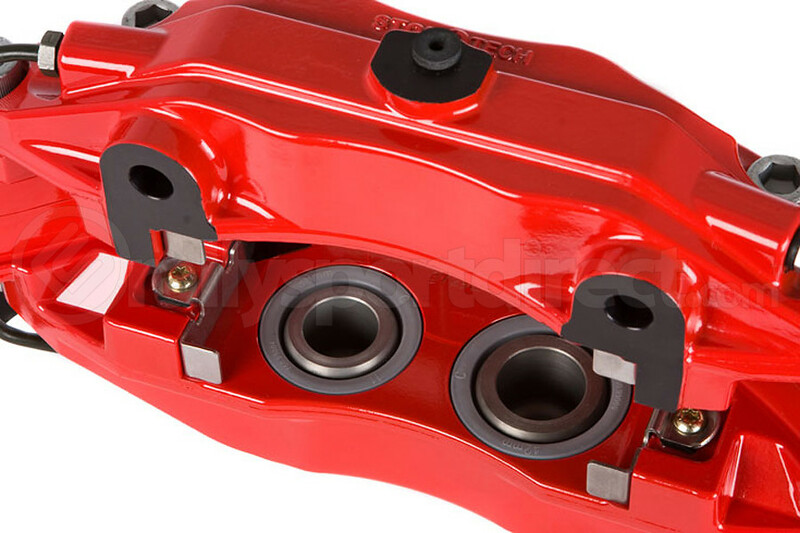 The 2 bolts are placed at the bottom of the OEM caliper by the Axle. Once you get the caliper off, depending on how much of a groove your rotors have, you should be able to slide the caliper right of the rotor. We used a 1/2″ to 3/8″ adapter. I know we said not to, but we did, and well, broke the adapter. 6 POINT Socket! THIS IS A MUST! These are the bolts you are removing. Set the caliper on a box, or hang it with a wire or zip tie off the strut to keep the brake line from stretching. 3) Take off the 12MM bolt that hold the brake line on to the bottom strut mount. You can also see in this image the top bolt where the bolt holds the caliper on to the hub. IMPORTANT: DO NOT TAKE THE BRAKE LINES OFF YET! As you will drain the master cylinder for the brakes, and create a huge issue. The brake lines is the LAST THING to remove! 4) Take off the stock rotor so the hub is exposed. Then get your sand paper and take off the rust that was between the hat and the hub. Even a little rust will cause the rotor to not sit flush (the car has 5K miles and as you can see, rust already started to form). What it looked like after. You don’t need to make it look new and shiny, just take off the coating of rust. 5) Remove the dust shield that sits behind the Rotor. Due to the size difference between the stock rotor and StopTech Rotor, this shield will need to be modified. They are 12MM bolts, 3 of them. Next to the new rotor you will see why you need to take it off and bend it. 6) Take the shield and grab a hammer. 7) Put the shield back on the hub and tighten the hardware to about 10-14ft lbs. Important: Take the new rotor and put it on the hub, then move the new rotor back and forth and look for contact between the shield and the rotor. Wherever you see contact, you will need to bend the shield away from the rotor. Any contact will cause issues and unwanted noise. 8) Next is attaching the new StopTech bracket to the hub. You’ll want to grab the included hardware and Loctite. Hardware (use only 2 per side) Washer goes on top of the bolt. Apply some Loctite on the bolt. And put the bracket on to the hub so that the 2 bolts that the caliper attaches to are on the inside of the hub (toward the inside of the car). They are 19MM. Now Start to thread in the hardware. Tighten both the top and the lower bolt as tight as you can with out putting too much weight into it. You’ll want about the same amount of pressure on both the bolts. Get the torque wrench and tighten the hardware to 75-80Ft/lbs. 9) DO NOT SKIP THIS STEP! CLEAN THE ROTOR WITH SOAP AND WATER, WIPE IT DOWN, AND THEN CLEAN THE OUTSIDE SURFACE OF THE ROTOR WITH BRAKE CLEANER! Failure to do so will cause the pads and the rotor to not seat properly. 10) Take the proper caliper and the 5mm allen and take out the 2 bolts that hold the bridge to the caliper. Remember that the air feed is facing down on the bridge. 10) Now put the rotor on the hub and the caliper on the bracket. Now tighten the 2 bolts that hold the caliper to the bracket (washers sit on top of the caliper between the bolt and caliper). Get the 1/2″ 6-point socket. Now torque down the bolts to 40ft/lbs. 11) Now insert the new pads with the friction material towards the rotor. The pad must be perfectly straight going in. If it is a little to one side or the other, it will require a lot of force to put in. They should go in by hand with no hammers or high force needed. Now insert the bridge and the hardware. Insert the hardware. With the washer being between the caliper and the head of the bolt. When installing new brake lines, this is how the brass washers should sit on the banjo end. How it sits on the caliper. Tighten it to 14ft/lbs. 9/16″ 6 point socket. Attach the line to the bottom of the strut. 12MM socket. Brake line to hard line. Top is a 17MM and the bottom is a 10MM. On the top use a 17MM open end wrench. On the bottom, YOU MUST USE A 10MM BOX END WRENCH. IF NOT YOU WILL STRIP IT! Pop out the retainer clip the holds the line to the chassis with a flat head screw driver. Important: Once you take this fitting off, brake fluid will start leaking out fast. Make sure you work quickly, as too much time will cause your master cylinder to drain out. (THIS BRAKE KIT WAS DESIGNED TO WORK ON THE 1993-2007 Impreza, in 2008, Subaru changed the fitting on the solid brake line, so either a) you must use a Technafit Brake Line b) Wait for a couple more weeks for StopTech to come out with lines c) use your stock line until StopTech has one out specifically for the 2008) We are using the Technafit lines and we have NO ISSUES! Now attach the new line to the hard line on the car and clean up the brake fluid ASAP with soap and water as the fluid WILL EAT THE PAINT OFF THE CAR AND OFF THE CALIPER! MAKE SURE YOUR BRAKE LINES ARE NOT TOUCHING THE STRUT AT ANY STEERING ANGLE! 13) NOW DO THE SAME THING TO THE OTHER SIDE OF THE CAR Change the OEM Brakes to the new brakes. We use the Motive Power Bleeder to make it a quick and clean. Hook up the power bleeder to the master cylinder. Fill the canister 1/3 full with brake fluid and pressurize the can to NO MORE THAN 14PSI! Attach the clear hose to the inside valve on the caliper and get your 7/16″ wrench on the valve. Open the Valve about 1/2 turn and watch the fluid. The fluid will take a second to start coming out. But you will notice that at 1st it will have a lot of air bubbles. Keep the valve open until the fluid coming out has no air bubbles. After you do the inside, do the outside of the caliper. 15) After you bleed the new calipers, bleed the entire system, from rear to front. Make sure all the fluid is air free. Keep an eye on the Power Bleeder and make sure that it is above 6PSI of pressure and has plenty of fluid. 16) After you’ve flushed all the brake fluid in the system, hop into the car and hit the brakes (after you take the pressure bleeder off the car) and the cap is on the master cylinder, and the valves are all closed. The first couple times you press the brakes, they will go to the ground, but after you pump it 2-3 times, pressure will be fully up and your pedal should feel very stiff. If it is not, you might still have air in the system. 17) Put your rims on and torque them down to the OEM spec. We torqued them down to 85ft/lbs. Enjoy the new look! 18) Breaking in your new brakes. First time you apply the brakes you should be going VERY SLOW. In case anything happens your able to safely stop. If the brakes are working properly proceed to slowly increasing your speed. And just drive around carefully listening for abnormal noises. They brakes at first will not be as good as stock until the pads have had adequate hard stops and cooling cycles. 19 After the test drive go back and reinspect everything. Making sure nothing has come loose. Also check your brake fluid level and look for a drop in fluid level. If its lower than when you left, you might have a leak! You will notice that there will be a ring on your inner rim where fluid from the rotor has got out, this is OK. It’s just manufacturing oil from the rotors. Just make sure its oil and not brake fluid! Thanks and you bet! Glad we could help!